A mosque has received an official warning after leaflets calling for the killing of a sect of Muslims were found on display. Piles of the flyers, which say Ahmadis should face death if they refuse to convert to mainstream Islam, were found in Stockwell Green mosque. The Charity Commission found the mosque had failed in its duties, and had no control over literature on display. The mosque in south London has been approached for comment. A BBC investigation found the leaflets were authored by an ex-head of Khatme Nabuwwat, a group based in Pakistan which lists the mosque as its "overseas office". Previously a mosque trustee said he had never seen the leaflets before and suggested they were fakes or had been left there maliciously. Islamic missionary group Khatme Nabuwwat believes Ahmadis are apostates, commonly defined as people who have abandoned their religion. The leaflets said those who refuse to convert to mainstream Islam within three days should face a "capital sentence" - or death penalty. Stockwell Green mosque claims there is no connection with Khatme Nabuwwat, despite sharing the same name and evidence suggesting the Pakistani organisation had control over its Imam. 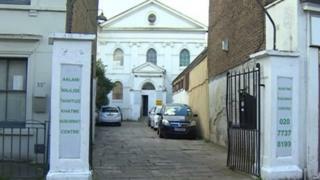 The mosque was unable to disprove its links to the Pakistani organisation, according to the Charity Commission. The Charity Commission was unable to establish who left the literature at the mosque, or "whether the literature referred to by the BBC was ever available from the charity's premises". It also concluded the mosque had no controls over who could leave literature or host speakers at events. An official warning was issued over the mosque's "failure to ensure that they comply with charity law". Under the warning trustees must take all reasonable steps to ensure that future statutory accounts and annual returns are submitted on time. Following several interventions by the Charity Commission, new rules have since been put in place.